NOTE: I thought I'd published this post months ago. Oops. There were 9 professional competitors (and 27 amateurs--I was not a judge for that contest, thank the Lord) and competitors came from South Carolina, Alabama, Ohio, Arkansas, and other points south of the Mason-Dixon line. Each judging sheet had places for each 9 ribs and 9 sauces. The ribs were judged by taste, texture, and appearance. Each sauce was based on the same. There were so many ribs to try, I couldn't eat them all in one sitting. The scale to judge the ribs is between 2 and 9. No one category can get a score of 1 or a perfect score of 10. TRUE STORY: There were 6 judges total, from all walks of life: newspaper journalists, editors, quality control specialists for beer, wine and food...and me. We'd tasted 4 different ribs and all of them lackluster. Run-of-the-mill ribs with mediocre taste, fair-to-middling texture and forgettable taste. Then we tasted the 4th rib. So hot, tangy, smoky, deep layers of flavor, pink with perfect smoke ring, succulent, moist, and the best rib I'd ever eaten in my life. Hands down, I scribbled three 9's for my scores. I happily ate through 4 more ribs, saving the bulk for my post-judging feast. Lo and behold, the number 4 rib was Bib's Downtown from here in Winston-Salem. 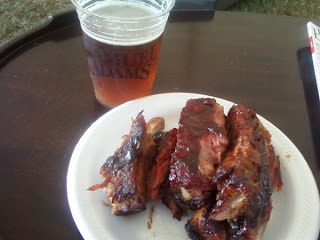 Ultimately, Bib's won Grand Champion, Best Ribs and People's Choice. Yes, I live here in Winston-Salem, but I'd never had ribs from Bib's--only pulled pork and brisket. The losers other competitors were so pissed off, they thought the contest was rigged and stormed off the stage in a huff. Drama! Sounds like Heaven on Earth to be able to judge something like that. I love all kinds of ribs and sauces! I think my mouth just watered reading that last description you scored with three 9's. Oh, my.